Angela Raines is the pen name of Doris McCraw. Doris is an actor, historian, poet, photographer, and (of course) writer. After she retired Doris decided to pursue her other dreams. She performs as Helen (Hunt) Jackson, Katharine Lee Bates, as stand alone historic characters. She researched and wrote on Karol W Smith, Colorado's first film commissioner, and currently is researching the early women doctors of Colorado prior to 1900. She writes and post haiku with her photographs, five days a week on her fivesevenfive page. 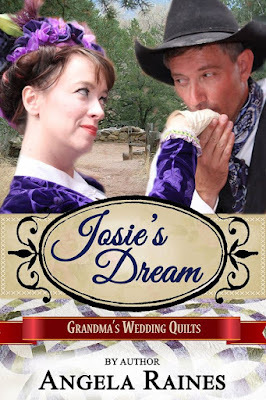 Josephine, Josie, Forrester FOLLOWS her DREAM and heads to the Eastern Plains of Colorado to be the doctor for the new town of Kiowa Wells. She faces the challenges of not only being a woman doctor, but earning the trust of the people in and near the town. Her life is complicated when William Murphy, a lawman, becomes her patient after being shot and losing his memory. Can these two find the love and happiness they deserve, despite a threat from the past? Can they get past their own beliefs about life and love and societies expectations to find the love and happiness they both deserve? I loved to hike and take trips to the mountains. 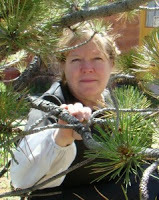 Of course research is a passion and am considered somewhat of an expert on the women doctors in Colorado prior to 1900. I don’t know that I ever realized it, I just always seemed to be a storyteller. I wrote plays as young as six. I spent over three years writing haiku five days a week and posted on a haiku blog I have. I am now working on writing haiku sonnets which I hope to start posting soon. Putting my seat in the chair and writing. I attend an improv writing group and it is there the characters finally will start telling me how they want their story to unfold. When I make the weekly meetings (weather permitting) a lot of basic writing gets done. I realized a lot of my stories are about redemption, and finding a place in life. Being honest and kind to yourself and following your dreams. Ebooks are great for some stories. I love that they can be carried anywhere. (you should see the list on my e-reader) At the same time, I love the feel of a book in my hand. My bookshelves are a testament to that. Also, I prefer print books when I’m researching, especially if I want to have the information on hand. I have one novel and numerous novellas. Three of the novellas are characters from one town, and I will continue telling the stories of the population of Agate Gulch. The town of Kiowa Wells, in Josie’s Dream is also a wealth of people I have come to love and hope to tell their stories in the future. I try to add historic elements and facts to all of my stories. As a lover of history, I think it important to ground the story in what was and add the what could have been. I will be writing another Medieval short story this year, along with a non-fiction book on women doctors. A couple of novels are on the agenda for 2018. I like to take the time to research and let the stories and characters come to me. Once that happens things move fairly quickly.